Worked at a very fine gauge, this slip-stitch scarf takes advantage of the yarn’s softness, in addition to highlighting its magical color changes. As you knit, watch the colors shift and change throughout both skeins. The geometric tessellations of this slip-stitch pattern trick the eye, while the drape of the fabric delights the touch. With about 18 rows to the inch, this scarf grows very slowly as you work. The finished result is worthy of your patience. With MC, CO 80 sts. Work in garter st for 10 rows. 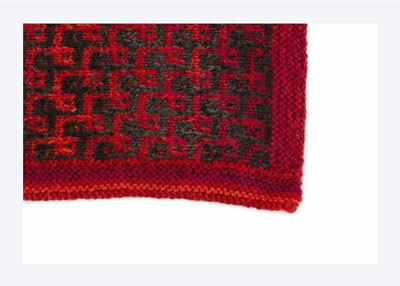 Rep Rows 1–16 of noir chart until scarf measures 34″, or desired length. Break MC and weave in end. Cont with CC only, work 10 rows in garter st. BO. 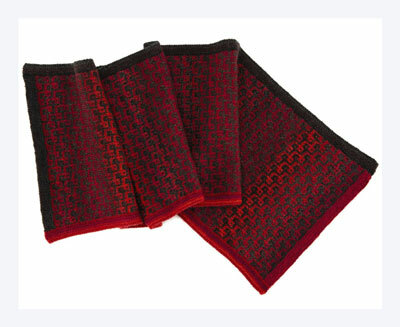 With MC, pick up and knit 324 sts along one edge of scarf. Work 10 rows in garter st. BO. Rep with CC along opposite edge. To finish weave in ends and block.